Let your mint go to flower and it will attract bees, beneficial wasps, hoverflies (aphid eaters), and tachinid flies (parasitic on nasty bugs). The smell of the mint plant will also repel houseflies, cabbage moths, ants, aphids, squash bugs, fleas, mosquitoes, and even mice. Not a bad deal, if you ask me! Chickens love fresh herbs and mint is no exception. The best part is that it’s also great for them and their coop. It keeps bugs, flies, and parasites at bay, as well as being an antioxidant and digestive aid for your flock. Be sure to plant lots of mint (as well as other herbs) in and around the coop and run for chickens to nibble on daily. Mint is also great for cats and dogs. Catnip is actually in the mint family and is a favorite herb for kitties as well as humans. While cats and dogs probably shouldn’t eat a whole lot of mint in one sitting, a little bit is great for them. 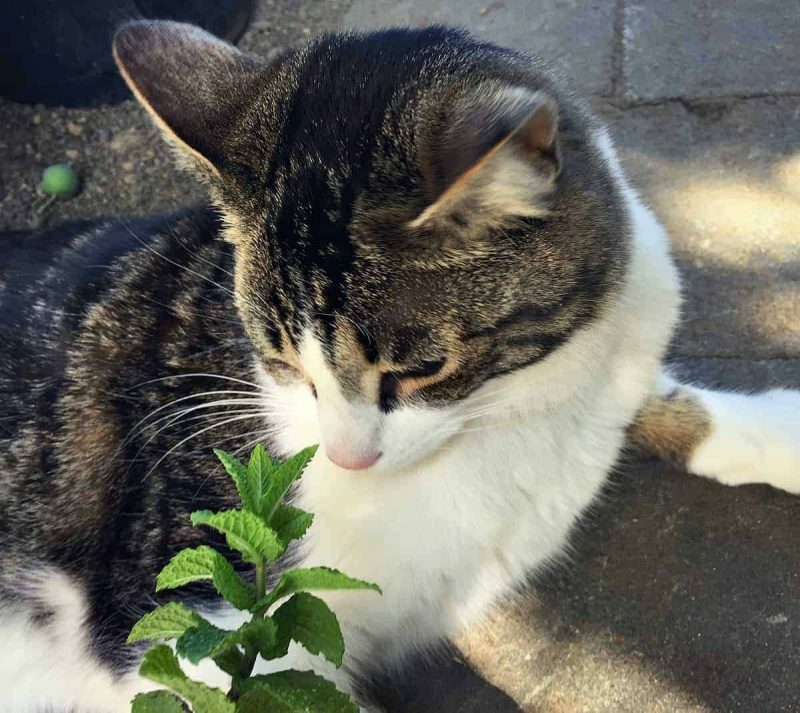 It is a natural flea repellent, and I often see Cosmo the kitty rubbing up against the mint plant. Of course, mint is an awesome culinary herb! Cut it from the garden without abandon to make all kinds of delicious treats. I particularly like to make tea with it, hot or iced! Turn it into mint pesto or add it to your favorite homemade cookies, brownies, or this decadent sounding fresh mint cake with dark chocolate mint frosting. 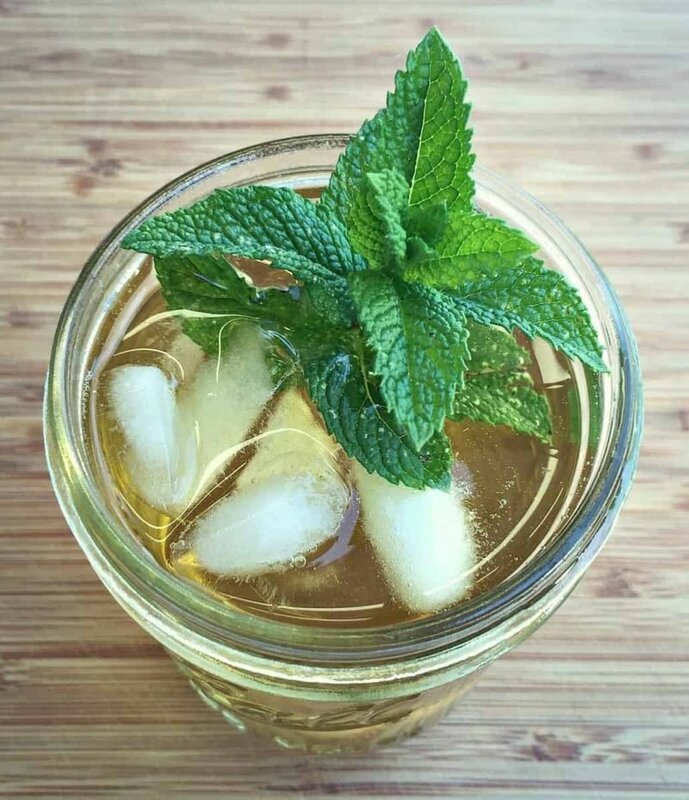 Get creative and make mint infused honey, a gallon of mint wine, or chocolate mint extract. This rhubarb mint jam sounds delicious, so does this traditional mint sauce for lamb. You can also just simply chop it up and add to salads or use it as a garnish. Have a mint julep or mojito party, you deserve it! Mint is also an amazing medicinal herb. It is well known as a digestive aid and breath freshener and is also good for an upset stomach. Peppermint is especially great for headaches, and the essential oil can be rubbed on the temples for relief. It can be helpful for seasonal allergies, and can also be added to body care products like salves and lip balms, soaps, shampoo bars, and lotions. This entry was posted in Caring For your Garden, Garden, Gardening, Herb Garden Care: Types by jordan1. Bookmark the permalink.